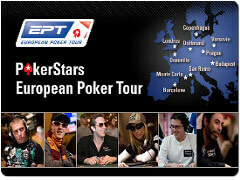 Over the course of the two starting days a record-setting 1,082 players registered for the PokerStars European Poker Tour (EPT) Barcelona Main Event. Heading into Day 3, with the money-bubble looming, the field had been trimmed down to just 207 players. By the end of Day 3 there was a mere 61 players still alive in the event, all with dreams of the €1 million that will be awarded to the winner of the tournament. Leading the way into Day 4 was Antonin Duda, who bagged-up 1,470,000 chips to edge out Samuel Rodriguez, who finished Day 3 with 1,416,000. The only other player to top the 1 million chip mark was Ilari “ziigmund” Sahamies who has been amongst the chip-leaders throughout the tournament. Sahamies ended Day 3 with 1,269,000 as he looks for his first major tournament win. While some of the big names in the game fell by the wayside on Wednesday, many managed to move on to Day 4 including John Juanda, Andrey Zaichenko, Matthias De Muleder, Roberto Romanello, Morten Christensen, Morten Mortensen, Jonathan Karamalikis, and Konstantin Puchkov. A number of female players also managed to make it to Day 4, most notably Season 8 EPT Monte Carlo runner-up Lucille Cailly, Team PokerStars Pro Fatima Moreira de Melo, and Lock Poker Pro Leo Margets. A few other ladies managed to survive the money bubble, but failed to make it through to Day 4, including Ana Marquez who finished in 115th place, and Xuan Liu who finished in 88th place. The final 61 players are all guaranteed at least €14,150, but with a seven-figure payday at stake you can expect most of the players remaining to be playing for the win, and not to merely make the next pay jump. Day 4 will once again kick-off at Noon local time, with the players now in level 20 with blinds at 5,000/10,000 and antes of 1,000 chips. As was the case yesterday, the tournament structure will see the remaining participants play 90-minute levels. Thursday will be the first day of the tournament not a strict time schedule as the field is set to play-down to the final three tables (24 players) before calling it a night.